This year, our whole Party, people, and armed forces will solemnly celebrate the 70th Anniversary of War Invalids and Martyrs’ Day (July 27th, 1947 – July 27th, 2017), coincident with the time the whole nation is accelerating implementation of the Politburo’s Directive 05-CT/TW (12th Tenure) on promoting the studying and following of the ideology, morality, and style of President Ho Chi Minh. Against such backdrop, we become more and more imbued with Ho Chi Minh’s teaching: “War invalids, sick veterans, military families, and martyrs’ families are those with meritorious services to the Fatherland and people. Consequently, we owe a duty of gratitude, love, and care to them.” On thoroughly grasping his teaching, over the past 70 years, the Party, State, and the whole society have paid much attention to and actively and effectively carried out activities to render thanks and gratitude to war invalids, martyrs, and people with meritorious services to the revolution. This serves as sentiment, conscience, and sacred duty and responsibility of succeeding generations to people who laid down their lives, or sacrificed part of their blood and flesh, as well as their individual interests for the common victory of our nation. Resolutions adopted at Party’s congresses have consistently affirmed the goals and missions of policy work regarding people with meritorious services to the revolution. Accordingly, policy and legal systems have been developed, issued, and gradually improved to institutionalize the Party and State’s guidelines on the provision of care for people with meritorious services to the revolution. On recognizing position and role of this task, the movement aimed at providing care for families of war invalids, martyrs, and people with meritorious services to the revolution has drawn attention of the whole society; mobilized huge potential of communities; and recorded a number of achievements in the realms of politics, society, economy, culture, and so forth. “Dutiful and humane” activities, “soldiers’ winter,” etc., in early years after the August Revolution, and later movements, including sentimental orchard gardens, fish ponds, rice fields, jars of rice, etc., in the war of resistance against American aggression have become the whole people’s movement to provide care for war invalids and martyrs’ families with five major programmes, including houses of gratitude; “Gratitude Fund”; savings books of gratitude; provision of care for heavily wounded soldiers, elderly and lonely parents of martyrs, and martyrs’ children; and support of Vietnamese heroic mothers in the age of renewal. In addition, in order to bring comfort to martyrs’ families, our Party, State, and military, over the past few years, have paid special attention to leading and directing the search and gathering of martyrs’ remains. Projects in memory of martyrs have been regularly maintained and preserved like historic and cultural sites of fine arts and traditional education by local Party executive committees, authorities, and people. Those activities constitute deep gratefulness, moral standards, and fine traditions of our people; responsibility of Party executive committees, authorities, social organizations and unions, and people from various walks of life to those with meritorious services to the country and revolution. 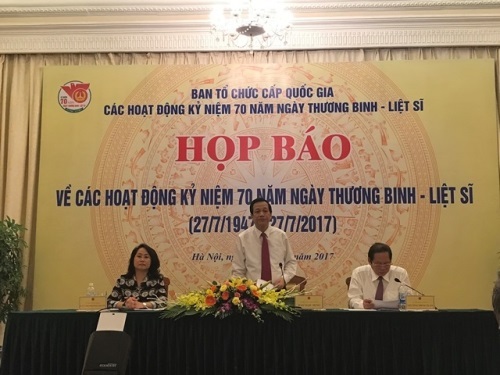 Implementing Decision 22/2013/QĐ-TTg, dated April 26th, 2013, the Government has spent over VND2,450 billion on supporting 80,000 households of people with meritorious services to the revolution but are in need of accommodation; all of Vietnamese heroic mothers are raised by localities or units; 97 per cent of communes and wards perform well their work regarding war invalids and martyrs; 98,5 per cent of people with meritorious services to the revolution enjoy equal or higher standard of living than that of local residents. Those achievements have contributed to asserting the superiority of socialist regime in our country; demonstrated people’s attention, sentiment, and responsibility to those who devoted, contributed, and sacrificed their lives for the Fatherland. That respect, appreciation, and provision of support for people with meritorious services to the revolution represent fulfillment of obligations towards history; promote the glorious revolutionary tradition; emphasize the Party and people’s enormous achievements; and improve the human tradition and fine features of culture of Vietnamese people. At the same time, they will help to reinforce people’s confidence in the Party’s leadership, the State management, and the great solidarity of the whole nation, laying the foundation for ensuring sociopolitical stability and building and firmly safeguarding the Fatherland. First, promoting propaganda and education among people about the need of enhancing social activities regarding gratitude work. Accordingly, Party executive committees at all levels should direct well the dissemination of the Party and State’s guidelines and policies on people with meritorious services to the revolution, making all sociopolitical organizations and people perceive that good realization of gratitude policy and program constitutes their responsibility and moral standards to the great sacrifice made by their elders, and a practical activity to continue to bring into play humanity, loyalty, patriotism, and revolutionary heroism in the new era. Properly performing moral standards of “drinking the water, remembering its source” and “rendering thanks and gratitude” today represent practical deeds, which contribute to consolidating the great solidarity of the whole nation and generating synthesized strength to build and safeguard firmly the Fatherland. Second, continuing to perfect the system of legal normative documents dealing with guiding the implementation of Ordinance on preferential treatment of people with meritorious services to the revolution, which serves as the basis to implement preferential regimes with entitled people in a synchronous and full manner. The Ministry of Labour – War Invalids and Social Affairs coordinates closely with other ministries and branches to proactively advise and make recommendations to the Party and State on the continued renewal and improvement of policies on people with meritorious services to the revolution. There is a need to promote the leading role of Party executive committees at all levels and renovate State management in the realm of people with meritorious services to the revolution, meeting the demand of making progress and social justice in every development step and policy. Management must be renewed, especially in renovation of administrative procedures, to facilitate authentication and payment of allowances, and other preferential regimes in a rapid, timely, and comprehensive manner, creating favourable conditions for people with meritorious services to the revolution as well as their families to enjoy preferential rights and regimes provided by the Party, State, and people. Increased importance should be attached to the inspection and supervision of implementation process to combat corruption in these sensitive social areas. Third, strengthening the all-people participation in the movements of “rendering thanks and gratitude” and “drinking the water, remembering its source” through practical and effective deeds. Implementation of “five gratitude programmes” and “all-people participation in the provision of care for war invalids, martyrs’ families, and people with meritorious services to the revolution” must be continued to create favourable conditions for the development of gratitude movements and programmes under the guidelines of “the State, people, and persons entitled to enjoy preferential policies make joint effort.” It is necessary to carry out socialization of the provision of care for people with meritorious services to the revolution; give prominence to responsibility of authorities at all levels; mobilize people’s resources and participation of social unions and organizations in gratitude work; well implement preliminary assessment, summation, praise, and proliferation of shining examples in gratitude movements and subjects of preferential policies who have displayed their effort in production, business, study, work, and so forth. Fourth, accurately and fully pursuing policies on preferential treatment of people with meritorious services to the revolution as stipulated in the Prime Minister’s Directive 02/CT-TTg, dated January 25th, 2016, and Directive 21/CT-TTg, dated May 22nd, 2017 on strengthening provision of care for people with meritorious services to the revolution to commemorate the 70th anniversary of War Invalids and Martyrs’ Day in a practical manner. Accordingly, there is a need to focus on mending and upgrading martyrs’ cemeteries, monuments, and memorial steles, especially in northern border provinces; actively identify the unknown fallen soldiers by means of practical evidence and DNA tests; actively mobilize organizations, enterprises, and people to take part in growing gratitude funds at all levels through various concrete forms, in accordance with practical conditions; and visit and bring comfort to people with meritorious services to the revolution, who are taken care of at convalescent centres, and prominent families under preferential treatment policy, and so forth. We are building a socialist law-governed state of the people, by the people, and for the people and striving toward the goal of prosperous people, a powerful country, and a democratic, equal, and civilized society. Good implementation of the gratitude movement in the new era constitutes sentiment and sacred responsibility of the whole political system and every person. This is not only a matter of moral standards and tradition, but a matter of politics, ideology, economy, and society; not only an urgent task in the short term, but a significant mission in the long term in the process of building and defending the Fatherland today. Our attitude towards history will be the key to opening the future of our country and our people.